Republican presidential hopefuls Mitt Romney and Rudy Giuliani clashed over tax and spending cuts Tuesday, each claiming greater commitment than the other in a debate in the nation's struggling manufacturing heartland. The government "is spending money of future generations and those yet to be born," added Fred Thompson, making his debate debut after a late entry into the race. He said future retirees should receive smaller Social Security benefits than they have been promised. 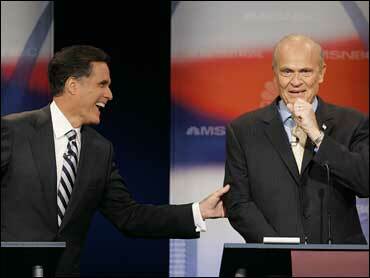 Thompson played it safe while Giuliani and Romney argued over taxes, reports CBS News correspondent Nancy Cordes. "With all eyes on Thompson, he performed about as he has throughout the campaign thus far - marginally well but not particularly jumping off the charts," wrote CBSNews.com senior political editor Vaughn Ververs in Horserace. After months of polite debate sparring, Giuliani and Romney squared off without hesitation, a reflection of their struggle for primacy in the race for their party's presidential nomination. "I cut taxes 23 times. I believe in tax cuts," said Giuliani, former mayor of New York and leader in national Republican polls. Romney in turn criticized his rival for once filing a court challenge to a law that gave President Clinton the right to veto spending items line by line. "I'm in favor of the line item veto," he said, adding he exercised it 844 times while governor of Massachusetts. Romney also said that while mayor, Giuliani "fought to keep the commuter tax, which is a very substantial tax ... on consumers coming into New York." The former governor leads his rivals in the polls in Iowa, where caucuses will be the first contest of the campaign, and he and Giuliani are in a close race in surveys in New Hampshire, the leadoff primary state. Giuliani responded that spending fell in New York while he was mayor, and rose in Massachusetts while Romney was governor. "The point is that you've got to control taxes. I did it, he didn't. ... I led, he lagged." "It's all baloney," retorted Romney. "I did not increase taxes in Massachusetts. I lowered taxes." The clash was among the most heated of the campaign for the Republican presidential nomination, reflecting a quickening pace as the 2008 caucuses and primaries draw close. It also left Thompson and the other contenders as something of bystanders for the several moments that Romney and Giuliani went at one another. All nine of the men on stage sought to stress their conservative economic credentials throughout the two-hour debate, held in the city that gave birth to the Ford Motor Co. more than a century ago. Sen. John McCain of Arizona said President Bush was right to veto a children's health expansion bill, and he urged him to reject a multibillion-dollar public works measure as well. "We've got to get wasteful spending under control," he said. "We have to get spending under control," agreed Kansas Sen. Sam Brownback. No matter whether Republicans or Democrats are in control of Congress, he said, "the system is built to spend." Challenged to identify one government account he would cut, Brownback cited a program involving "advanced technology." "If you want to control federal spending you must look at Social Security and Medicare," said Rep. Tom Tancredo of Colorado. He said he favors private Social Security accounts, or "forget the idea of ending deficit spending." While maneuvering against one another, the Republicans found a minute or two to jab at Democrats. Giuliani criticized Sen. Hillary Rodham Clinton, the Democratic presidential front-runner, for a proposal to provide tax cuts of up to $1,000 to help families open 401(k) retirement accounts. "Hillary is filled with endless ways to spend. We're going to have to control that," he said. Romney criticized Michigan Gov. Jennifer Granholm for raising taxes, and drew laughter when he said he was afraid she "was going to put a tax on this debate." Eight of the candidates support the continuing U.S. military presence in Iraq, but Rep. Ron Paul of Texas drew a loud round of applause when he loudly dissented. Paul posted a surprising $5 million in campaign donations for the three months ending Sept. 30. By decision of the debate's producers, the first question of the event went to Thompson, making his first appearance with rivals who have been campaigning for months. He said the economy is strong, with no threat of a recession in the immediate future. Former Arkansas Gov. Mike Huckabee said not everyone was well off. "I want to make sure people understand that for many people on this stage the economy's doing terrifically well, but for a lot of Americans it's not doing so well. The people who handle the bags and make the beds at our hotels and serve the food, many of them are having to work two jobs," he said. Romney said it was inexcusable that Michigan was in what he called a nonstop recession, with high unemployment. He said the president must have an open door policy when it comes to the auto industry. Thompson drew a good-humored jab at one point, when Romney likened the ongoing series of Republican debates to "Law & Order," the television program that helped Thompson establish his acting credentials. "It's got a huge cast, the series goes on forever and Fred Thompson shows up at the end," he said. "And to think I was going to be the best actor on stage," replied Thompson with a smile. After fielding the first question, Thompson also drew the last. Asked whether he had waited too long to join the race, he said he had not, then joked he had watched the earlier debates. "It was getting a little boring without me," he said.